Things haven't really slowed down, although it's been nice to get a little more time at home. My dance classes start in 2 weeks, so I've been putting things away from the musical, doing fall cleaning, and planning and getting people registered for dance classes. Lydia and Elijah were both home briefly before heading off to college, and this week I began my own independent studies for continuing education. I came down with a fever/cold on Wednesday, and am trying to get over that. At least it's given me some time to read and rest! I've finally uploaded pictures and slideshows from the musical. 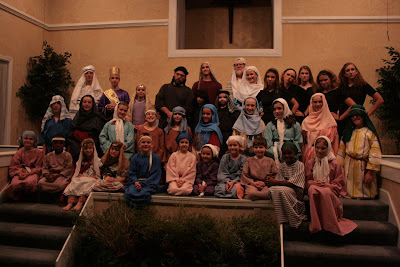 The Picasa Album has pictures in chronological order telling the basic story of the musical. This slideshow introduces the cast of characters, and played at the beginning of each presentaion. The other slideshow played at the end each presentation, and shares pictures from the reherasals and dress rehearsals. You can click the links to go to each album/slideshow, or go to The King's Courts' blog to read more about them. Be sure to watch the slideshows, because the music in the background is played by Miriam Rebekah! She sweetly allowed me to use music from the CD recorded at her senior recital. One of the pieces was composed by her brother Caleb, and it is absolutely beautiful! This musical was probably the most work of any that I've done, but it was definitely worth it. I learned a lot about delegation and was blessed by the many people that stepped up to help with joy. I could never have done it alone. Each night the audience really seemed to enjoy it. In the past few weeks I have continued to be encouraged as I hear from different people blessed by it. God is so good! He has used this musical in ways beyond I could have imagined. The 12 families involved were such a blessing to work with. God really brought everyone together to work in unity. From 7 different churches and 6 different cities, it was a blessing to see how God used everyone. 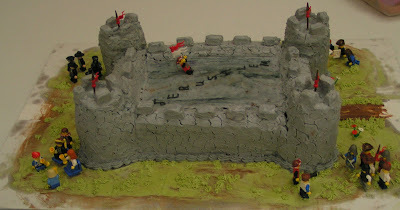 To top it all off, one of the families used their cake-decorating skills to make a cake decorated like the Jerusalem walls with scenes from the musical depticted with legos. It was fun to work with this group on this fun and exciting musical. The memories are many and good. I look forward to future productions as God leads! College brings with it a new environment, new friends, new things to learn, and a place where you are known for who you are. Rarely does anyone there know your family, so you get to present yourself to people who have no idea who you are. It can be tempting to change your personality and try to be someone you really aren't, but it is not wise. It can be a good opportunity to try new things, and change is inevitable in new circumstances, but you should be careful to truly live as the person God created you to be. Along the same lines, don't give up dreams that you have or change your opinions just because they're not in style or "politically correct." Don't be afraid to share your views - you may find other like-minded friends as a result! They may have just been too scared to say anything. Hopefully you have spent the last years growing in your relationship with the Lord and have grown strong in His Word. Even if you haven't, now is the time to really pursue the Lord above all else and ask Him to show you His ways for your life. At college, whether at a "Christian" one or not, you will have opportunities to do things that you know aren't right. But, when "everyone" is doing something and it seems like such a little thing - and besides, no one back home would really know - it can be hard to stand fast in what you know you should do. It is so important not to compromise, however. The little things you give in to and explain away lead to bigger things as you get desensitized. If your conscious bothers you and you know that you shouldn't do something, don't do it! Even if it doesn't make sense why it wouldn't be right, don't sear your conscience. God's Holy Spirit will lead with His gentle probings - attune your heart to His voice and follow as He leads. You won't regret it! As you stand fast in the convictions God has given you, it will be easy to judge those around you or feel superior when you see them doing things that you know aren't right. While there are definite lines of right and wrong, you shouldn't judge others and try to hold them accountable to your personal convictions. You will meet many people from different backgrounds, different family situations, different schooling experiences, different stages of their walk with the Lord, as well some non-Christians, and you will make friends with many of these people. It will be extremely hard to know what to do about some of the things they think are just fine, when you know that they're not right for you. However, pray for God's guidance and guard against pride. It will be hard to stand firm and not compromise, but it will be even harder not to judge those that are doing exactly what you are standing against. God has given us grace to live life in many different ways, and we are not to demand of others that they do just as we do. However, in the situations that you know are wrong, you must ask for God to be your guide in what you should do, and ask that He fill you with His love towards others. In many situations, it will not be the time nor place for you to say something. Sometimes just by living your life and purposing to glorify God in all that you do, others will notice. They will be drawn to you and your example, and you may cause them to think. They will be much more open if they come to you instead of you self-righteously going to them. You may be amazed at how many people are watching the way you live and who thank you for standing firm and yet showing God's love and encouraging them. However, you also shouldn't be afraid to go and talk to someone should God lead you to do that. Sometimes, He will use you to say the very things that they need to hear. Listening to and obeying God is crucial in these situations. Live a life of grace towards others, remembering that God has given you much grace in forgiving your sins and bringing you to where you are now. Three years ago (plus 4 days, to be exact! ), Maidens of Worth was launched. 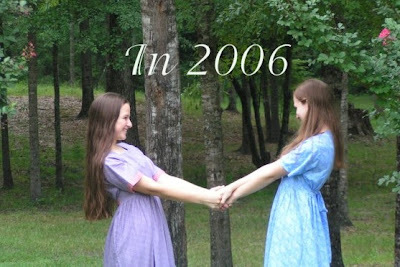 Our first posts on August 11th, 2006 shared about our friendship - our similarities and differences - and pictures of us growing together through the years. 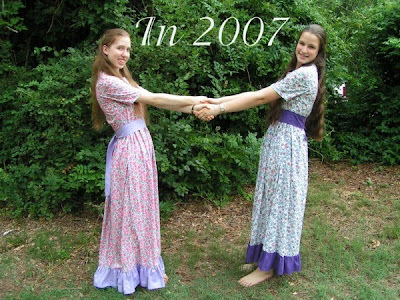 It's hard to believe that it's been 15 years since our families first met each other, 8 years since we began to really have a close friendship, and 3 years since we began this blog together. So much has happened, so many memories have been made, and through it all, God has kept our friendship strong. There still more to learn about each other even after all this time, and we continue to grow closer each day. This last year has been full of changes, but though separated by miles, we continued to keep up-to-date with letters, emails, and occasional phone calls. After a wonderful summer together, the miles will again separate us, although in a sense we've traded places. This time, it will be Miriam headed off to college while Anna stays at home. However, both of us are excited about the year ahead, though our circumstances are quite different. Though we have and will continue to make new friends, we will always share a special bond. No matter where life takes us, we look forward to being together, either in person or in thoughts and prayers. This blog has continued to grow, although posting has slowed down in the past few months. It is our hope to write more regularly in the coming year, but we can't be sure of what the future will bring. There will be many things demanding our attention - college assignments and music practice for Miriam, teaching, directing, and studying from home for Anna - and real life ultimately takes precedence over the virtual. Our thirst for writing and sharing hasn't diminished, however. Sometimes it takes a while to put things into words, and we're also learning that not everything is worth being shared. We pray that what we have written has been a blessing, however, and we have enjoyed connecting with readers throughout the years. It has been an encouragement to hear from people all over the world! For our 3rd blogaversary, we are asking you each to share one of your favorite quotes. It can be a Bible verse, a line from a song, a saying you like, or a quote that has been meaningful for you. Please include the reference or author if possible. Of course, if you wish to include in your comment how you found our blog, how long you've been reading it, favorite posts, and/or topics you would like to see us address, we would enjoy your doing so! We look forward to continuing our journeys through the year ahead, living life as unto the Lord, purposing to be maidens of true worth in His sight, and sharing our thoughts and experiences. Each day is a new adventure! Buy sheets! I got some great sheets and curtains at thrift stores for $1-$2 each for the costumes we made for the upcoming musical. It's a much better deal than the price per yard that fabric has risen to these days. Read more about the costume construction for "The Amazing Jerusalem Makeover."